SpotLight Parking CTO Karan Singhal (left) and CEO Mike Miele (center) with Kevin J. Leary, president of VPNE. Earlier this year, Kevin J. Leary, president of VPNE Parking Solutions, met with representatives of a San Francisco startup that wanted to rent spaces in Boston parking garages managed by his company. The startup, Luxe Valet Inc., which offers a mobile app that allows drivers to summon valets rather than search for parking, needed the spaces for cars that its valets would pick up in the Financial District, the North End, and the Back Bay. But instead of money, Leary saw trouble. Leary instead invested in a local company developing a parking app that would let VPNE compete with Luxe, joining other old-economy companies that are fighting back against upstarts such as the ride-hailing services Uber and Lyft, the home-sharing service Airbnb, and the handyman service TaskRabbit. Taxi drivers in New York and Philadelphia, for example, are adopting Way2Ride — it’s an app developed by the Silicon Valley electronic payments firm Verifone Systems Inc. — to compete with Uber and Lyft. In Chicago, Handyman Connection, which sends repair contractors to homeowners requesting them, has turned to a Boston startup, Dispatch, to tie its system into smartphone apps to meet the challenge from TaskRabbit. Last year, the Madrid financial services company BBVA SA, reacting to competition from financial tech startups, spent $117 million to acquire Simple, an Oregon firm developing a mobile banking application. 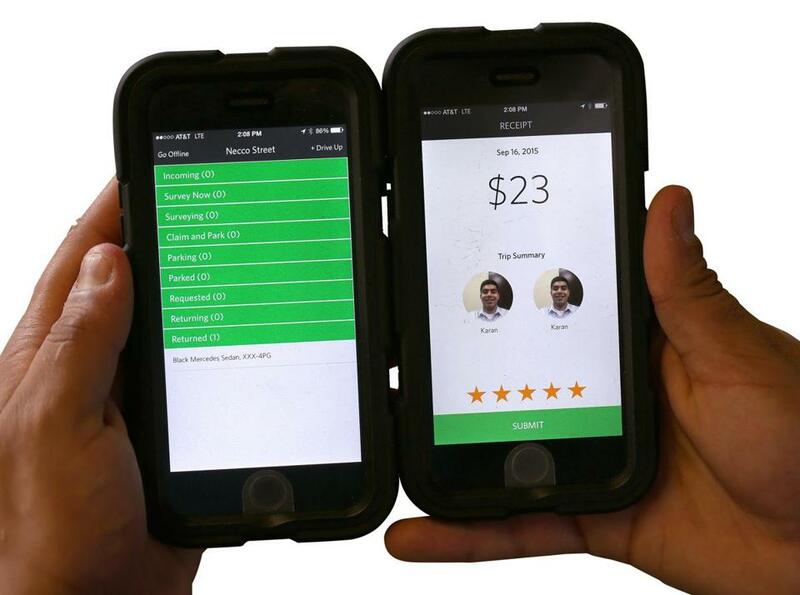 And in 2013, Avis Budget Group dealt with disruption in its industry by buying the Cambridge car-rental service Zipcar Inc.
Leary and VPNE are investing in SpotLight Parking, the brainchild of two recent Tufts University graduates. Leary declined to say how much VPNE invested in SpotLight, but it is one of Spotlight’s first outside investors. The startup has raised nearly $1 million, said Michael Miele, who cofounded the company with a fellow Tufts graduate, Karan Singhal. The parking app, in the final stages of development, should be available by the end of the year, Miele said. Customers will be able to download the SpotLight app to their smartphones and look for “hotspots,” or locations where valet parking service is available. Right now, the hotspots are all for VPNE garages, but eventually SpotLight would offer it to other parking garage operators. Hotspots are usually in front of a garage or at designated valet spots near restaurants. The app connects the customer and the valet, displaying a photo of the VPNE valet who will park the car. It also notifies the valet that the driver is approaching. The valet parks the car in the garage and then returns it to the hotspot when the driver is ready to leave. Payment is done through the app. Prices have not been set, but they will be cheaper than the usual cost of parking in the garages, which can range from $20 to $40 a day, Miele said. Leary said he expects the app to bring additional business and turn over more spaces in the garages, increasing his company’s revenue. Spotlight will take a cut of the fees. Luxe, which has raised $25 million in venture capital and operates in nine cities, was launched in Boston in June. Lauren Sheerr, its general manager for Boston, said the company sees itself as a logistics firm and has no interest in becoming a parking operator. The company works with local and national parking companies to lease spaces in garages, bringing them extra business, Sheerr said. Luxe charges customers up to $25 a day. Luxe is not the only new competitor that VPNE and other parking operators will face. Zirx, a San Francisco on-demand valet service, has raised more than $36 million and operates in seven cities.